Call of Duty: Black Ops Resurrection is supposedly the final offering of Treyarch that would include zombies. The game includes four original Worlds at War maps that feature a completely new twist, namely Shi No Numa, Nacht Der Untoten, Verruckt and finally Der Reise. It also includes a brand new map, Moon, which is sure to blow you away. The Moon map comes free with the purchase of the Collector’s Edition. If you choose not to get the Collector’s Edition, you get all these re-mastered maps as well as moon. Call of Duty: Black Ops Resurrection is designed to cater specifically for the avid and loyal Zombie fan. It is considered to be the season finale. When Zombies were originally launched, Treyarch tried to ensure that they would move forward from there, that all visuals got a fresh look and that every map had a fresh and new way to play it. They eventually realized that if they had to shoot people up in the air with water and they had to brainstorm and come and come up with something epic and bigger than that. And what’s more epic than floating? Treyarch put in all their efforts and began working on the concept of going to the moon. Their team wanted to buckle down and create the ultimate Zombie playground on the Moon. It is the culmination of all the new features that have been introduced since the original launch of all the DLC in addition to a whole plethora of brand new game play features. Call of Duty: Black Ops Resurrection’s Moon map includes something from almost every map in the DLC. It features caves, outdoor spaces, buildings and monumental structures to name a few. The sound design of the Moon map is unbelievable accurate and takes into consideration the airless environment. It significantly changes how the game sounds and ensures that gamers approach and play it differently. Treyarch originally designed the Call of Duty: Black Ops Resurrection’s Moon map with floating in mind and thought it would be easier. They thought that things would be slower and gamers would have time to shoot Black Ops Nazi Zombies in slow motion. Quite the opposite is true, as everything is floating and you have no control, so you sail past your intended turning point which makes the game really challenging. Treyarch claim that they are trying to tell a story through an action game which has got a lot of challenges. 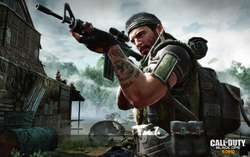 It creates an entirely new fictional scenario that lets players have a completely new experience inside Call of Duty. Treyarch goes on to say that Call of Duty: Black Ops Resurrection is a tribute to Zombies and their fans. They ensure that it is because of the constant feedback from gamers all over the world, that they are able to constantly work at getting better games into the market. Resurrection was made available on 23rd August 2011 on Xbox 360 first and has five all new maps on Xbox live.